This exercise pulley helps to increase arm and shoulder strength and flexibility. 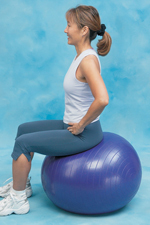 Ideal for people who need to do shoulder strengthening exercises because of a stroke or other shoulder injury. This piece of exercise equipment requires good hand grip for proper use. Easy-to-install door bracket fits over the top edge of any standard size door. Because of it's compact size, the exercise pulley can be packed for travel.